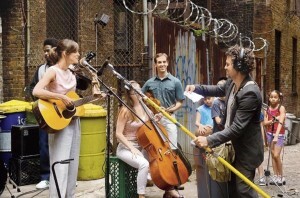 At several levels, I can totally relate with the movie Begin Again. First off, it turned out to be a surprisingly better choice for me over the latest Transformers sequel as it saved me from the deafening noise of machines talking, whirring, clanging, crashing and exploding. Instead, I was treated to excellent music superbly mixed and delivered by the finest theater sound-system you cannot carry around in an iPod or even install in your house, while spun around an optimistic but realistic story (a multi-faceted love story thankfully unlike what many would expect as it relates to the idea of music production or, as I see it, the innocent, artistic side of being a composer). No, I was actually thinking I was watching a retelling of my own life as a songwriter/producer. Or, if not my actual experiences, at least my views about music as a craft and as a business, about relationships and about life as a whole. I wish I could have watched the movie again just to get a better grasp of the dialogue and the nuances of some characters’ evolution into what they could be the epitome of people who rule our music industry. But as an out-of-the-way film about out-of-the-way music, I doubt if it will ever ring bells among the profit-oriented composers and producers among us. Nevertheless, this painfully raw but brutally powerful film deserves five stars for even making a gallant stand against the music powers-that-be. How many watched or preferred it over other films is the big question. But, hey, I am overjoyed that even in the character of Keira Knightley, Greta, an idealistic music-writer exists who simply finds joy and fulfilment in hearing her songs (or singing it to her cat) and not to hear it played on the radio — decorated or enhanced to please the music executives. Her initial disgust at the idea of recording her song set the theme all throughout the movie with a mellowing at the end when she realizes every artist must work the machine to some degree so that what her cat hears can be heard by humans as well. At those initial levels, the movie succeeds for me. Nothing else would matter; but there is more. Aside from the fact that Greta rides a bike around New York City, she also is the kind of person who does not think twice of humbly serving people she cares for. From her boy friend, Dave Kohl, played by Adam Levine whom she dutifully follows around as a supportive “coffee-server/waiter” and “inspiration”, she also serves her partner-producer Dan’s (played by Mark Ruffalo) daughter like a “social-worker” on duty – teaching her how to dress, how to attract the right kind of boy-friend and how to play with a band. On top of that, she bravely counsels the father how to treat a daughter as a father should and not as an absentee-father that he is. Her character seems a bit stretched beyond reality; but, hey, stranger things happen in real life. Here is an artist who truly knows life and knows that life is not merely escaping into a dream-world of musical ideas to describe her view of the perfect world; she actually ends up making songs that explode with the angst that life deals her (like the Dear John song – Like a Fool — composed and recorded on an iPhone for her boy-friend) and frees herself of the things that burden rather than define or bless her. But one of the most fatal stabs the film succeeds in punching a hole on the fabric of the giant music industry is not even shown in the main body of the movie but in the end-credits. (A sort of final kick in the — as you like it!) Those who leave before then or do not listen carefully would easily miss the subtle attack against profiteers out there. She decides to reject the offer of a big music label in favor of producing her album herself and selling it online for — what? just $2 per album! Again, here is an artist who compromises a bit to make some profit off her work but does so by allowing more people to access her creative work. Not that talent is cheap, as the film seems to be saying; real talent must be made available to as many people as possible. That is, in spite of the potential her work has to rake in much money if pushed through the usual music production process, she opts for using the Internet and its alternative music stores to reach as many people as possible. Which, in the business sense, actually makes a lot of sense! That is how you defeat the giants. Remain small but accessible. With so many artists doing that, who needs giants? The film is either describing or starting a revolution. The movie (as the title seems to suggest) must be giving everyone of us a chance to look at music, together with the artistic and business sides of it as well, with a fresh look, showing us how to begin again with the basics of why we make or listen to music in the first place. The song is the product of a person whose heart and soul give birth to emotions worth writing about. Whoever is or are involved in the song or the story of the song is all that matters for the true artist. We write to set free what is burning within us. The catharsis is the fulfilment itself. Whether others listen (or listen in) or not is less of a concern. The song is finished the moment it is written and sung by the writer. But the producer, oftentimes, hears arrangements and applause and money jingling as the song plays. The two sounds are entirely two different things altogether. Much of what we hear then (even the many best hits we love), may not be what the writer meant it to be. Yes, we must admit, many hits would not have been released without the music machinery that exists. But imagine how many more beautiful and honest songs we would have had if things were done differently from the way they are done now, slowly through alternative ways suggested by the film. The genuine songwriter hears only the words and melody of the song and nothing else. Others may hear something else; and therein lies the danger of losing the essence of the song. And often, that is what happens. Next time you listen to a song, listen to the silent voice of the writer and, if possible, just a guitar or a keyboard behind it, and not just the singer (unless, of course, if it is Randy Newman!). Oftentimes, you will hear what the song is originally all about and not what we want it to mean. Even Dave Kohl or Adam Levine, the epitome of the rock star in and out of the movie, realizes this as he sings the song Keira’s character had written for him (or, more precisely, for the two of them), albeit too late. It may not be too late for many of us to begin again, not just in the artistic or professional sense but in the moral or spiritual sense. That at those moments when we are at the end of our rope, we can still find the hope to begin a fresh start in life. But sometimes, it takes a real life-artist (meaning, a genuine observer of life and the undying principles that govern it) to find out how to begin again.